One day while riding the F train, Keith Haring discovered empty subway advertising spaces covered with black paper. Taking note of the soft matted quality of the paper, Haring instinctively concluded that white chalk would be the perfect medium for this surface. Not only was the chalk easy to conceal, but it also produced a crisp, tactile effect against the paper. Haring’s interest in art marketization and the commercialization of his signature icons. 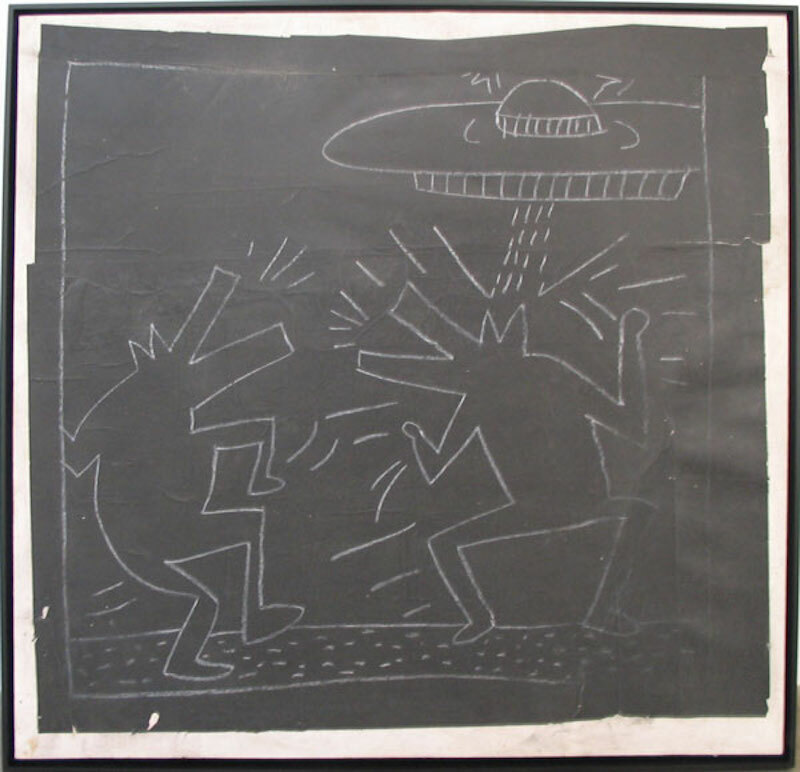 Between 1980-1985, Haring worked on his Subway series chalk drawing. often creating 40 drawings per day, Haring used the public space to interact with locals, therefore creating a dialogue inherent within his work. The endeavor began serendipitously when Haring noticed one of these blank panels in the station at Times Square and immediately went above ground to buy some chalk. The resulting process of drawing on these panels, a hobby that Haring later called a responsibility fueled his early work. Cultivating the project remained an important activity for him until 1985, long after he had achieved international critical and commercial success. Haring became captivated by the commitment to drawing worthy of risk that for him was one of the many attributes of the work of graffiti artists gaining acceptance at the time. Not wanting to imitate their efforts, and mindful of the science of semiotics to which he had been recently introduced, Haring started to regard the subway as a laboratory for communication and engagement. Motivated by the contact with a diverse (non-art) audience the Manhattan Transit Authority enabled, Haring regarded the MTA as an ideal platform for experimenting with a vocabulary of readily identifiable figures, such as the radiant baby, the barking dog, the hovering angel, and the flying saucer, among many others. Constructed entirely from outlines, each of these characters are staged within a frame lining the perimeter of every black sheet, a unifying trope of Haring’s work that could reference the television screen, the proscenium, or box from a comic strip. Due to prolific repetition and inexhaustible permutation, these characters assumed the identity of potent signs that could address a range of themes, both topical and universal, in a manner ideally suited to the pace and viewing conditions of commuters.